Build the test chamber to meet your exact needs. A custom FD test chamber built with access for vibration table. A thermal shock test chamber with additional ambient (middle) compartment. A Lab Oven with Bi-parting Doors. Custom chamber with vibration table and winch door. 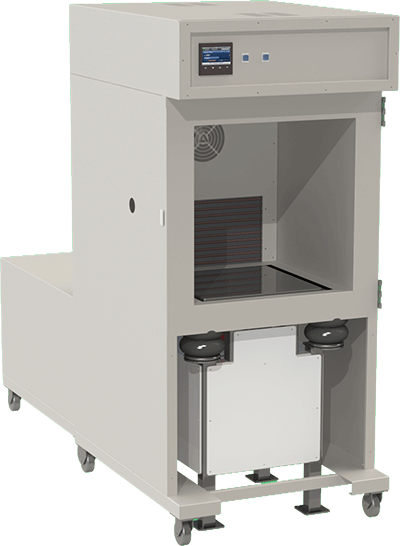 AES is proud to offer a fully customizable line of environmental test chambers for our clients. Our team of experienced engineers will work with you to modify one of our existing test chamber lines with available options or design a completely custom unit to fit perfectly within your current testing operation. 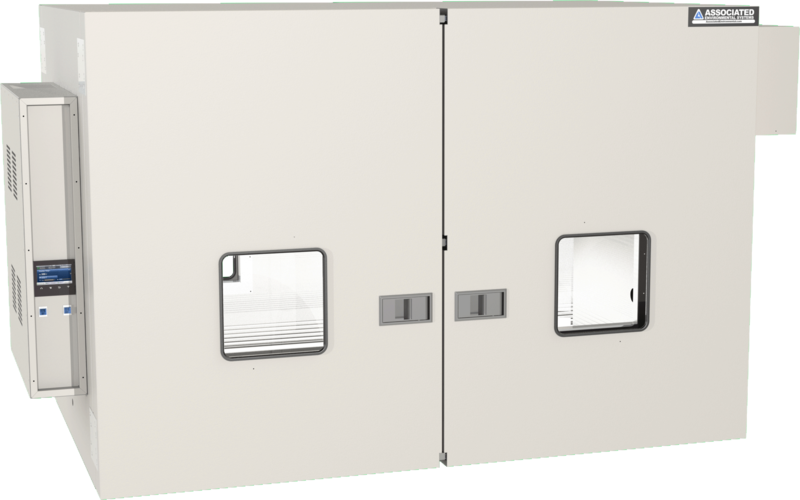 Test chambers are used in just about every industry imaginable and this diversity, in regards to the customer base, creates an interesting challenge for test chamber manufacturers. 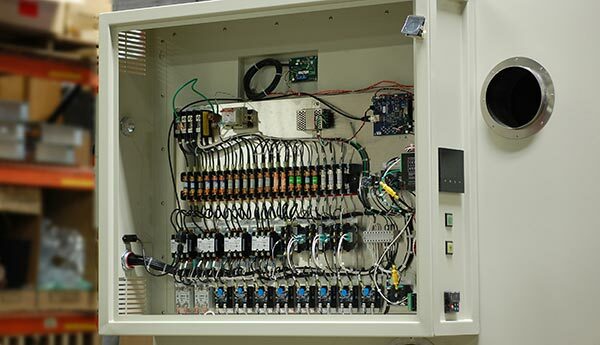 When every customer is different, almost every chamber sold must be modified to accommodate a unique sample or test design whether it’s a simple customization, such as an extra port, or a complex one requiring re-­engineering, prompt communication between the customer and the build team is crucial. AES end-­users are in direct contact with our engineering design team to formulate their specific test chamber specification within a timely and efficient process. When designing a custom test chamber, we are very mindful of factors that affect influence our device performance. Variables which may affect ramp up and pull down times are the test chamber size, temperature range and power of the heating or refrigeration system. 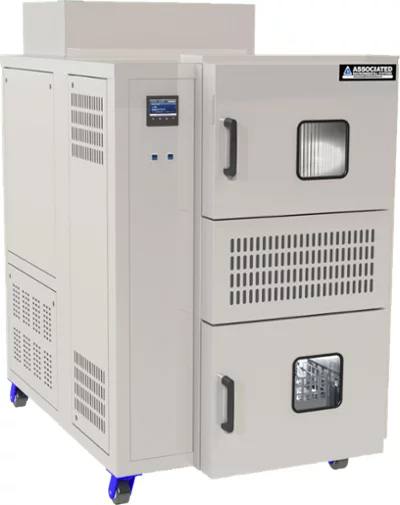 Typically the bigger the test chamber and more extreme the temperature range, the longer it will take the chamber to reach the maximum or minimum temperature. 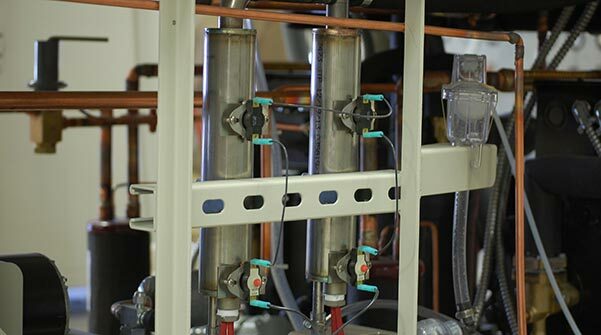 Usually a more powerful heating and refrigeration system will be used for larger chambers to keep these larger test chambers’ change rate consistent with smaller test chambers of the same series. The benefit to the customer is a test chamber solution that truly optimizes their test resources, processes and goals, ultimately getting them the information they need, when they need it. 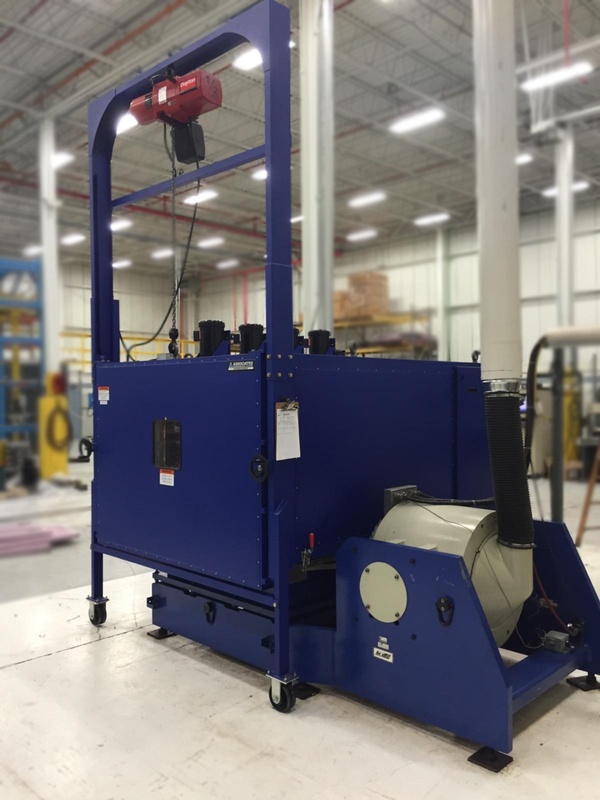 Working custom makes adapting to strange shaped or large items simple, allows for support of unusual environmental testing conditions, and take all the stress out of integrating a test chamber into a specific or limited building or space as we also handle custom installation. We will happily work around your current situation to ensure your testing chamber is as efficient and effective as possible. A non-traditional size test chamber was outfitted with dual steam generators for humidity control. 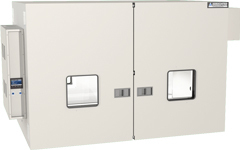 Depending on the size of the unit, AES is happy to customize all test chamber systems to meet customer needs. A test chamber built with multiple large access ports for easy item manipulation during testing. 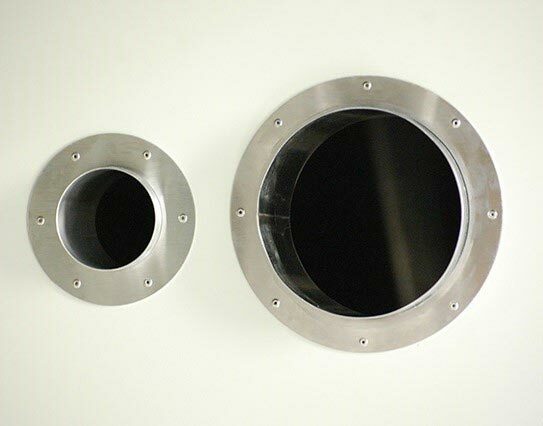 Glove boxes may even be added to larger test chambers for safe and direct manipulation of items during condition testing. 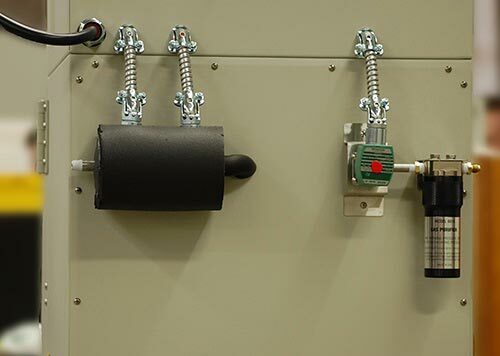 This test chamber was built with a removable electrical panel for easy transportation and installation. This panel is hardwired to the test chamber body via a flexible hose which allowed this chamber to fit through a standard 34" doorway. A test chamber with both CO2 and LN2 boost cool options. This option is quite common among small lab ovens as it allows for intense heat and cooling to manipulate the most severe environmental conditions.